Alternative text (ALT) is an HTML attribute that essentially acts as a description of a web object for search engines and screen readers. It can be used on a variety of web elements, such as images and fields in a form. Humans generally never see ALT text, unless the element the text is assigned to is broken or not yet loaded. 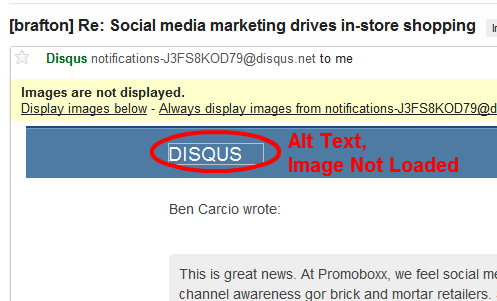 For instance, if an email client does not automatically load the images of new emails, recipients will probably see the image’s ALT text (if available) within the image’s placeholder box. Depending on users’ browser(s), ALT text may appear if hovering over the image or input field. It is strongly recommended that webmasters and content writers do not stuff the ALT attribute with unnecessary keywords, as it is considered a black-hat measure and not tolerated by Google. If excessive keywords are detected in link anchor text or ALT attributes of a web page, Google has been known to penalize the hosting domain through lower search rankings or outright deindexing.